There are millions of species of animals that are living on planet earth. All the species are not the same they have different characteristics line that varies from animal to animal. So, here we are listing 10 colour changing animals around the world. The changing colors in animals are one of the most amazing things that you see. We have also listed strongest animals in the world. The Cuttlefish is an undersea creature and one of the color changing animals in the world that uses its characteristics in order to defend herself. This will help the Cuttlefish to hide from the predators. It has the ability to change the color of rock, plants and much more in order to keep her safe in the extreme conditions. It also uses some kind of ink at the last moment for the defence purpose. The mating season of the fish is between the spring and summer. The male species are often beautifully coloured and more aggressive towards other males during the mating season. There are various rituals that have been performed by the male species to attract females. The package of sperms known as spermatophores into the mantle of the female. Later, female lays around 200 eggs on the rocks or seaweed until they hatch. The bad news is that the mother does not eat during the incubation period and hence dies out of exhaustion shortly after hatching. Pacific Tree Frog is usually found in North America. They can easily recognizable by their sticky toe pads. This is very helpful in climbing plants and trees. Pacific Tree Frog found in many different colors like green, tan, red, brown and green naturally but they can also change color according to the surroundings and hence one of the best color changing animals in the world. They can also use their color changing ability in order to defend them. The color can happen for 1 or 2 minutes in which it is very difficult for predators like snakes and birds to spot them. The frog species is the most widely distributed across the Washington State and can be seen in almost any habitat where there are suitable breeding waters just like small ponds. Apart from the small ponds, lakes and rivers are prefered because more suitable backwaters often occur at their edges. They love to eat diving beetles, giant water bugs, bluegill sunfish, and garter snakes. Golden Tortoise Beetle is a very small insect that usually found in North America. They are also known as golden bugs. They are very famous among the family of beetles because of one of the best color changing animals in that family. As soon as it any threat comes it automatically changes color to goldish orange. The changes in the color will last for about 2 to 3 minutes. So in this way, Golden Tortoise Beetle surprise and disguise the predator. 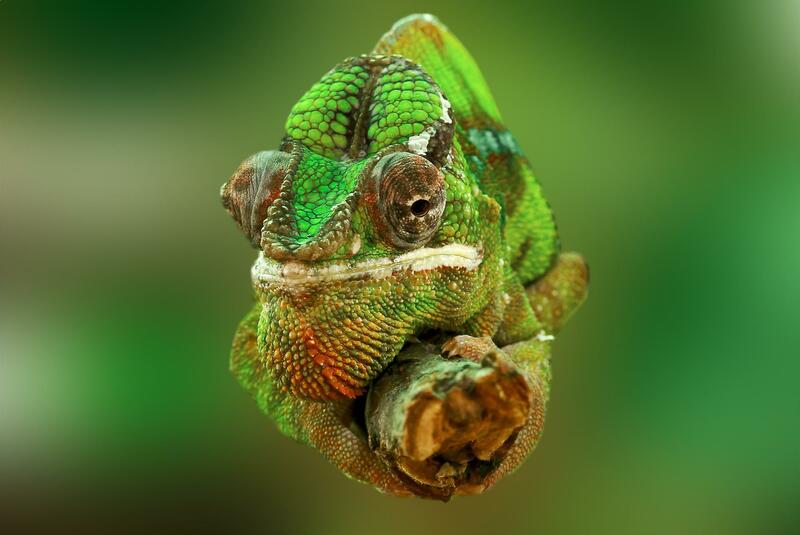 Chameleons are one of the most famous color changing animals around the world. The rapid change of skin color is the most amazing characteristics of the animal. The change of color in Chameleons is usually depended on their mood, the outside temperature and the intensity of light in the surroundings. There are also many species which can take any color. There are around 16 different species of Chameleons in total. Both males and females are not the same because the male has more ornaments such as horns, spikes and nasal-protrusions. These ornaments can be used when they have to defend their territory. These are not social animals, however, they tend to stick together and even to mate more intensively when the species is exposed to the ultraviolet light. One of the color changing animals, deposits eggs in the nests in the ground and the number of eggs depending on the species. Besides changing colors the North Pacific Giant Octopus is also famous for its size and one of the color changing animals in order to protect themselves from the predators. They have a weight of around 156 pounds which makes them oceans biggest. It is very large but at the same time, it’s very difficult to spot them. They are generally found in brown color but can change color depend on the mood. Also known as Giant Pacific Octopus is one of the largest and long-lived octopuses in the world. They are mostly seen in the along coastlines of the North Pacific Ocean. Talking about the appearance, they had a bulbous head with eight sucker-covered arms and a mantle. One of teh color changing animals is seen in reddish-brown but because of the special pigment cells in its skin change texture, they can camouflage any animal. Flounder fish is one of the perfect examples of adapting to a different habitat. They can easily change color depending on the habitat. They are naturally brown in color. They also have markings on the skin. The markings as well the color both changes as soon as they moved into the new habitat. The retina of the Flounder fish receives the light to detect the surface color of the new habitat and color changes accordingly. It is one of the most efficient color changing animals in the world. Basically, we can the most colour-changing animals are Reptiles and fish. They can easily survive even if the temperature is less than 50 degree Celsius. The thick fur helps them to be well adapted to live in the Arctic climate. The different body shape also helps Arctic Fox to conserve heat. One of the cutest animals changes the coat as per season. In the winters it is a bright and snowy white and in the summers they are light brown that helps it blend in with rocks. It can be considered as one of the most beautiful color changing animals. It is one of the animals found in Arctic region. It is also known as crab spider. These spiders are predators that wait very patiently on the leaves for their next meal. When they are sitting on plants they can change the color and can develop rich yellow, white or green that makes them completely invisible. This is happening due to the reflection of light. It is also one of the most beautiful color changing animals. These fish are termed as Ocean’s most decorated fish. If you try to find them in in different color ranges they are the one who can very easily change their colors, textures, and patterns depending on their background. It is very difficult to find this slowest sea animal. The only thing by which you can make guess is the twisty tail. One of the most beautiful color changing animals. They are one of the intelligent aquatic animals that usually found in the Indo-Pacific region. Their name says it all. The aquatic mimic Octopus can Mimic the different sea animals like snake, stingrays, and jellyfish by their body movement and change color characteristics. They can also take the color off the animal which they want to mimic. They also use the color changing in order to adapt to their surroundings. You can also read the most dangerous Amazon rainforest animals. These are the color changing animals in the world. Do post your comments.